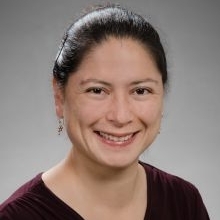 Kimiko Domoto-Reilly, MD, is a neurologist in the UW Memory and Brain Wellness Center, where she diagnoses and treats people with neurodegenerative diseases. She has expertise in frontotemporal degeneration spectrum diseases (FTD), including primary progressive aphasia and the behavioral variant of FTD. In collaboration with ADRC researchers, she studies cases of familial cases of autosomal dominantly-inherited neurodegenerative diseases, in order to better understand the factors influencing variation in age of onset, genetic penetrance, and disease progression. As a faculty researcher on the UW Integrated Brain Imaging Center, she works to develop tau positron emission tomography (tau PET) imaging as a research tool for understanding the role of tau proteins in Alzheimer's disease and FTD. She also leads two clinical trials at the UW: the AVID autopsy study and the Imaging Dementia — Evidence for Amyloid Scanning (IDEAS) Study, which is assessing the clinical usefulness and impact on patient-oriented outcomes of a brain amyloid PET scan that detects amyloid plaques, a core feature of Alzheimer’s disease, in patients with mild cognitive impairment (MCI) or dementia of uncertain cause. Dr. Domoto-Reilly also leads the ADRC Outreach, Recruitment, & Education Core's team efforts to raise awareness of Alzheimer’s disease and provide relevant education to community members, particularly to local and reservation-dwelling American Indians.